Gold prices fell to a two-week low on Thursday, as lower safe haven demand and uncertainty surrounding Federal Reserve policy led investors to sell positions. Gold for December delivery settled down 0.6% at $1,318.00 a troy ounce on the Comex division of the New York Mercantile Exchange, and traded as low as $1,312.10 earlier in the session. Prices closed at the lowest level since Sept. 1. The release of lackluster economic data, including weak retail sales, helped boost gold prices briefly Thursday morning. 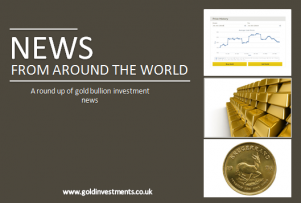 However, continued concerns over the possibility of an interest-rate increase next week has kept investors on edge, prompting some to close out long positions in gold, traders said. Article from the Wall Street Journal.